The origin story of After is more interesting than the film itself. This tale of college love and lust began life as a piece of One Direction fan fiction, putting a bad boy version of Harry Styles in a hot and heavy love affair with a bookish, sheltered freshman girl. 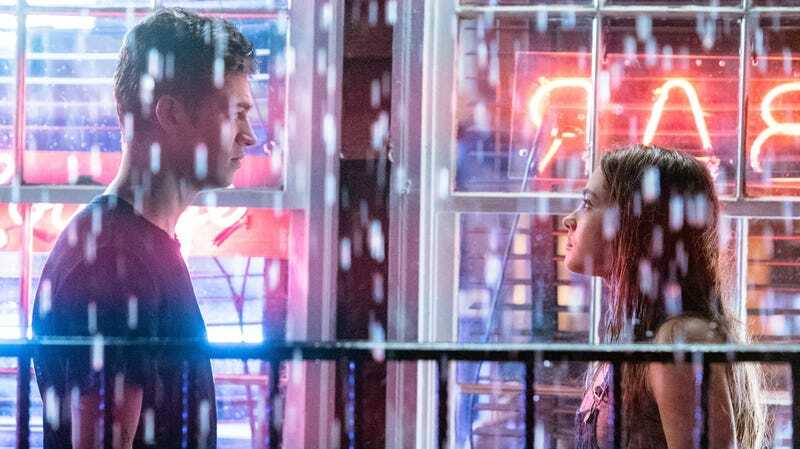 Several character name changes and five bestsellers later, Anna Todd’s After series has now been adapted into a big-screen romance. Fan-fiction roots are not, in and of themselves, reason to scoff; the canon of great art is filled with cultural remixes and self-insert wish fulfillment characters—just ask everyone from William Shakespeare to George Lucas. The real problem with After is that it’s a lifeless slog of thinly written clichés, one that’s missing the charismatic spark of the actual One Direction boys. There’s actually nothing in the film itself to link it to One Direction—no winking nods or cheeky needle drops. Instead, After’s “troubled bad boy meets earnest good girl” story feels like the latest riff on the dynamics that fueled Twilight and Fifty Shades Of Grey, the latter of which started as fan fiction of the former. The opposites attract spark between Tessa Young (Josephine Langford, sister of Katherine) and Hardin Scott (Hero Fiennes-Tiffin, nephew of Ralph and Joseph) also calls to mind generational touchstones like Rory and Jess on Gilmore Girls, Betty and Jughead on Riverdale, or even Jim Stark and Judy way back in Rebel Without A Cause. Hopefully you’ve seen at least some of those forerunners, because After—named for the fact that Tessa categorizes her life as “before Hardin” and “after”—makes no effort to give Hardin and Tessa’s love story any kind of specificity. He’s British and has tattoos. She has a ponytail and occasionally dresses like a boho peasant. What else do you need to know? The film vaguely springs to life only when director Jenny Gage explores Tessa’s tentative sexual awakening—the discovery that her high-school boyfriend was actually more of a friend and that Hardin unlocks a physical desire she didn’t even realize was there. After is a film about lust more than love, and it’s nice to see that explored from the perspective of a young woman. Yet the film is ultimately too limited by its PG-13 rating and too tied to its romantic narrative to fully delve into eroticism. Is there a toxic side to Hardin and Tessa’s obsessive relationship? After leaves the question open for the audience to ponder, though it’s hard to say if that’s an intentional artistic choice or just sequel baiting. Pride And Prejudice and Wuthering Heights are the two novels that keep coming up during Hardin and Tessa’s courtship, and it’s potentially intriguing to wonder if Hardin and Tessa are in the early days of a romantic comedy or a romantic tragedy. Unfortunately, After doesn’t seem to realize that Pride And Prejudice and Wuthering Heights are too very different stories, instead lumping them together in a list of great literary romances. That’s perhaps unsurprising, given that Hardin’s supposed literary prowess is established by the line, “The Great Gatsby, that’s a good book.” While the average One Direction music video might not have much more intellectual value than After, it’s almost certainly more entertaining.